Photo By Raymundo Frasquillo: Third seed Saint defeated fifth seed Morenci in two sets, 25-20 and 25-23, for the title of the 16th Morenci Invitational volleyball tourney Sept, 2. Tylene Miller coached the Tigers. Third-seeded Saint David captured the 6-team 2017 Morenci volleyball tourney title Sept. 2. The Tigers topped host and fifth-seeded Morenci in two sets, 25-20 and 25-23, during the finale in Wildcat Memorial Gymnasium. Since being eliminated by Fredonia in the first round of the 2007 state meet, with San Simon ending as state champion in five sets over Mogollon, the Tigers have finished no lower than the quarterfinalists during the previous nine seasons. Saint David ended the 2016 season as the 1A state champion, defeating Heber Mogollon in five sets as the fifth seed over the second seed; 2013 Division V state champions, defeating Glendale Prep as the top seed over the fifth seed. Photo By Raymundo Frasquillo: Diminutive Morenci senior Destiny Apodaca (No. 2) leaps up in the air to spike the ball against a Benson defender during round-robin pool play. She was one of two Wildcats selected to the all-tourney team of the all-day 16th Morenci Invitational volleyball tourney Sept. 2. The Tigers were Division V semifinalists in 2015 and 2014, quarter-finalists in 2012 with a 5-set loss as an eighth seed to top seed and eventual champion Veritas Prep, 2011 semifinalist as a fourth seed, losing in five sets to runner-up Mogollon; 2010 1A state runner-up to Veritas Prep in three sets; and 2009 and 2008 1A semifinalist, losing to eventual champion Valley Lutheran in four sets and in five sets to runner-up Mogollon, respectively. 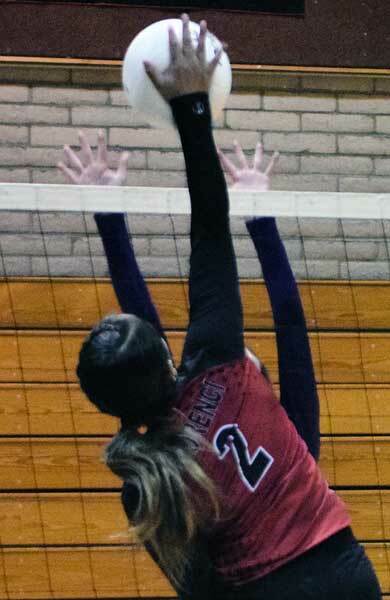 Saint David edged second seed Benson in two sets, 25-23 and 27-25 during the semifinal, and ousted sixth seed New Mexico Lordsburg by identical 25-13 set scores during the first round of bracket play. Morenci upset top seed New Mexico Bayard Cobre in two sets, 25-21 and 25-22, during the other semifinal, and came from behind to eliminate fourth seed Miami in three sets, dropping the first 19-25 and taking the next two 25-23 and 15-12, to advance to the championship match. Benson downed Cobre 2-0 (25-20, 25-19) to finish third. Selected to the honor team of the 16th Morenci Invitational meet, by vote of participating head coaches, were Jaylin Richardson and Kourtney Trejo of Saint David, Destiny Apodaca and Alexis Gregory of Morenci, Emily Darwin and Emmarae Wilson of Benson, Amaya Jacquez and Liza Ortiz of Cobre, Jayden Allinson and Anna Meredith of Miami, and Gabby Artiaga and Makenzie Evans of Lordsburg. Afternoon bracket seeds were decided by morning round-robin pool play results. The Cobre Indians and the Benson Bobcats both posted 4-1 records, with the Indians getting the top seed via a 30-27 head-to-head win over the Bobcats. Saint David went 3-2, Miami and Morenci both 2-3, and Lordsburg 0-5. Cobre also defeated Morenci 30-23, Miami 30-24, and Lordsburg 30-27. The Indians lost their meet opener 27-30 to Saint David. Benson prevailed 30-0 over Miami, 30-11 over Lordsburg, 30-15 over Morenci, and 30-25 over Saint David. Saint David bested Cobre 30-27, Morenci 30-25, and Miami 30-21; Miami downed both Lordsburg and Morenci by identical 30-27 scores, and Morenci defeated Lordsburg 30-14 and St. David 30-25. The Wildcats crossed the state’s eastern border twice, visiting the Lordsburg Mavericks for the season opener Aug. 29 and the Cobre Indians Aug. 31. Morenci swept the Mavericks in three sets, 25-12, 25-10, and 25-16 plus succumbed in three sets to the Indians, 23-25, 17-25, and 11-15. A first-time lineup was on the court together for the scrimmage with the visiting New Mexico Silver High Fighting Colts a week earlier. “We just have to tweak a little here and there,” second-year head coach Rhyanna Mennen said following the scrimmage. Photo By Raymundo Frasquillo: Morenci junior Alexis Gregory (No. 4) led the fifth-seeded Wildcats in low-fiving the fourth seed Miami Vandals following a 3-set (19-25, 25-23, 25-12) bracket first round win. The Wildcats also upset top seed New Mexico Bayard Cobre in two sets (25-21, 25-22) to reach the championship match of the 2017 Morenci Invitational. Gregory was named to the all-tourney team. The program has been improved considerably with the addition of an off-season fundamentals camp, attended by 16 of the current 28 members listed on three teams. Eleven student-athletes, seven seniors, three juniors, and a sophomore, represent Morenci on the varsity team. Four of eight returnees donning varsity jerseys attended a fundamentals camp during the off-season. Returnees include seniors include are Destiny Apodaca, Audrey Castillo, Alexis Gregory, Janeene Lang, Tatiana Sandoval, and Shaunee Seballos plus sophomore Angel Ontiveros. Juniors Payton Damron, Dominique Garcia, and Rhiannon Lang along with senior Damiana Rivera also comprise the varsity. The junior varsity team is juniors Caasi Apodaca, Kianna Rivera, and Jaim’ee Rodriguez; and sophomores Reona Alvarez, Reve Garcia, Sarina Robledo, Bridgid Silvester, and Aleeya Williams. Freshmen in the program include Jadyn Aguilera, Isabella Dillman, Elicia Esquivel, Candace Forgach-Aguilar, Elena Gomez, Lanae Leonard, Hunter Lindsey, Kayla O’Connell, and Amaya Sanchez. Morenci ended the 2016 season 15-14 overall, 4-8 in the 2A East Region, and 9-8 for seeding under Mennen. Traci Olmsted and Allison Moore are assisting Mennen. The Wildcats (5-5 overall, 1-1 for seeding) visit Miami Tuesday (Sept. 5) for varsity, junior varsity, and freshmen matches. The next home match is with Benson Sept. 12.